Lily is a young girl who is helping to make her home a holy place. Through Lily's story, told by Kristen M. Oaks and illustrated by award-winning Latter-day Saint artist Dan Burr, we are invited into Lily's home to share time with her family. Children will love seeing how Lily and the other children contribute to the spiritual environment of their home through their everyday activities. We seem them praying, working together, eating dinner as a family, reading the scriptures, counseling together to make good decisions, participating in family home evening, sharing the gospel with friends and family, and learning to love one another. They love the Lord and feel His Spirit in their home. This delightful book shows readers of every age how homes can becomes holy places in which children grow up in the Lord. The website www.HomeCanBeAHolyPlace.com is designed to be a living document. It develops the themes introduced in the book and is enriched by contributions from reader to reinforce teachings, expand ideas, and inspire children and parents to make their home a holy place. This is a fantastic book that shows the different aspects of family life. We follow a young girl, Lily, as she shares ways her family is living the gospel in her home. These include praying, celebrating, working, scripture reading, receiving blessings, eating together, making good decisions, unplugging from the world, honoring the Sabbath, holding Family Home Evening, gathering with friends, showing love towards each other and looking to the temple. I loved the illustrations! They help bring the story to life. I also enjoyed the scriptures and quotes from General Authorities that were included throughout the book. This is a book that families can enjoy reading together and will spark discussion on ways to strengthen homes and families. I also enjoyed visiting the website (www.HomeCanBeAHolyPlace.com) and reading the ways that others have expanded on these topics, including the unique dinner schedule, Family Home Evening ideas, family motto and making Christ the center of our homes. There's more, too, and it's just getting started! I love to hear what others are doing and am grateful when they're willing to share so that I can implement their great ideas in my own home. This is a book and website definitely worth checking out! I love the way this book shows various, simple settings in the life of young Lily's family. The artwork is beautiful, realistic, and descriptive, engaging an imagination. I read this with my nine year old daughter and she related really well to what was being said and the combination of the words and pictures brought these important concepts down to her level. I love how each page talks about one way to bring the Spirit into our homes and most pages had either a scripture or quote by a General Authority at the bottom to support it. This is specific to an LDS audience, but anyone can appreciate the different ways to bring a family closer together and make the home a haven of peace. A great ideal to strive for. While not strictly a story, My Home Can Be a Holy Place, shares the experiences of Lily and her family as they strive to make their home a holy place. 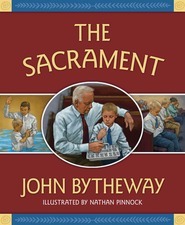 Each page details a particular aspect of their efforts, a home of prayer, a home where members work together, a home blessed by priesthood power, etc. Additionally, each page has a quote from a general authority or a scripture that highlights the principle being shared. Dan Burr's illustrations are gorgeous (as usual) and do a beautiful job of highlighting important aspects of the text. 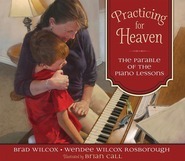 The book would work well with younger children and families that need help focusing on making their home a better place. Plus the book is just a beautiful reminder of what an ideal home looks like. While home is rarely a perfect place, following the principles outlined in this book will sure bring a family that much closer to it. Perfect for family home evenings or even bedtime. The book is beautifully put together with Dan Burr as the illustrator! It will bring a peace to your home and a tenderness to your heart! The theme is that you too can have a holy home if you follow some sound principles. Through ideas, scriptures, and thoughts from Church leaders this book gives you a multitude of ideas on how to make your home a holy place. This book would make a GREAT gift for your family or a family you cherish! Feel the love in your home by making it a holy place. I am so grateful for this amazing book. I loved the quotes from the prophets and apostles, even the scriptures because it made a world of a difference for the BEST. I couldn't have asked for a better book to describe how any home can be a holy place. It's a fantastic book, so I am glad I read it.